The colors above are kept in-stock, this is what we refer to in some descriptions on this site as "deluxe" leather. These top grain leathers will range from 4.5 to 5.5 ounce. The suede leathers will be 4 to 4.5 ounce. An ounce is approximately 1/64" in thickness. The "Earthtone" leather listed below is also kept in stock but the leathers will vary in colors and texture. Please read below for more information on the "Earthtone" leather. 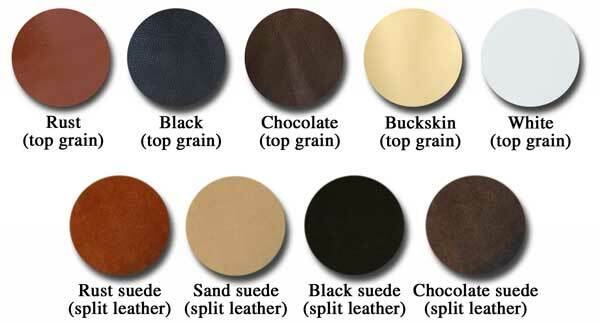 The "Earthtone" leather is a top grain leather ranging from 4.5 to 5.5 ounces. This is what we refer to in some descriptions on this site as "basic" leather. Most of our in-stock chaps are made from this leather because it is the best priced leather that we can buy. We buy these leathers in large quantity to obtain the best available pricing. This type of leather will offer you the best value. The colors and textures vary according to what the market has to offer at the time of purchase. We usually buy colors ranging from light to dark brown. If you want your chaps to be made from this leather, please call us about the current availability of colors. chaps. Just give us a call and we'll be glad to help.